sounds a lot like what someone might do any of the other three seasons. if this is so perhaps you can tell us why in the world people wouldn’t just live on one side of a hill or mountain and develop their own economy? I take it that would make LCF easier? Maybe be you can explain how living like a mountain gorilla would make LCF in the winter more sustainable? Both subjects broached by the OP. With that reasoning it would seem living like a Gorilla in Florida without mountains and eating leaves would be the most sustainable way to LCF in the winter. Since the op opined on this idea is it not proper to get it addressed? That stuff was a bit off-topic for the thread, perhaps, although somewhat in keeping with the relevance of urban design to LCF. if you can make the connection between winter cycling and mountain Gorillas and how they might help with urban development you have a greater imagination than I do. I don’t believe Jane Goodall ever ate with gorillas, leaves or not. I believe she studied Chimps. None of which has anything to do with winter cycling or climbing a mountain with or by bicycle. But if you see a connection I will have to say it has to be like ILTB has said before, just add LCF to any statement and it is in the spirit of the forum. I thought it was your sarcastic post 39 that really took the thread off track. Machka introduced the barrier that the hill poses to commuting in Hobart and tandempower was pointing out that in a car-free world, cities would evolve differently and each side of the hill would be a more self-contained community. Again, relevant to LCF, and if it was off topic for a winter commuting discussion, it wasn't because the OP took it there. no to be exact he asked why people couldn’t just live on one side of the hill. Having been to South America I can assure you coastal communities found a way to cross mountains without cars. I would imagine even in the winter. Looking at the trade that went on between California native Americans and the Navajo before the car was invented. Without the aid of Gorilla urban planners. In fact reading about how the Tour De France started it seems as if much of the race was on dirt paths created for trade between communities on.both sides of some serious mountains. But feel to participate in the delusion that man will be satisfied in one small area without exploring or traveling to trade or dominate another region. We can rewrite anthropology books with that concept. Well before cars by the way. See Hannibal. They even crossed water to “visit” Italy and some of it in winter. It it does keep the thread going if that is your intention. I still don’t see the connection with winter commuting or travel. If there was suddenly a compelling reason to stop all but the most essential motorized traffic in the area, would a more autonomous economic community emerge on the far side of the hill with only minimum shipping traffic over the hill and no commuting, or would people just move to other places where there's room? This is where things went off track in this thread. It's very hard to imagine a sudden compelling reason to stop all but the most essential motorised traffic in an area that has had transportation of one sort or another since 1804 ... actually possibly much longer. That said, once in the 5 years we've lived here (perhaps more during the time Rowan lived here prior to that), the roads over/around the hill were snowed/iced over and no traffic was allowed to go on them for a morning. Do you (or the city) have a plan for how to deal with that if it happens again? Did the buses run? There is if you read the many climate change articles that come out all the time, but we don't discuss that in LCF so it is the invisible elephant in the room that can't be mentioned because it makes denialists uncomfortable. How did you get to work? Snow shoes? Cross-country skiing? Snow day? No the buses did not run. 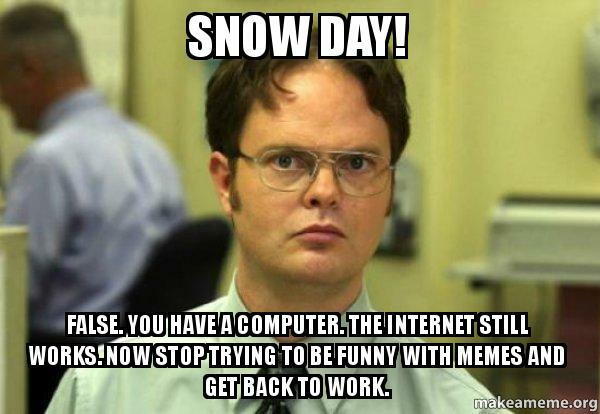 We all dealt with it by staying home for the day and doing a bit of work from home. And as I recall, I made a lot of progress on a uni assignment too. There was a massive flood in May, and the same sort of thing happened ... no buses for the morning, so no work that day. I'd like to work from home much more frequently, but my office isn't really set up for that except on odd occasions. Two "events" in 5 years that shut down the roads and buses for the morning and early afternoon isn't that big of a deal.